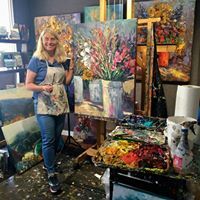 Delia's passion is painting ''en plein air,'' utilizing the outdoors as her studio where the natural light provides inspiration. Delia also loves painting in her studio/gallery ''Delia'' on 6th Street between Dolores & San Carlos in downtown Carmel-by-the-Sea. Stop by and visit her soon!